Between Xuhui and Pudong Districts, across the Huangpu River in Shanghai, is the Xupu Bridge. It's about seven kilometers upstream from the Lupu Bridge and it was completed in 1997, a few years after the Yangpu bridge. 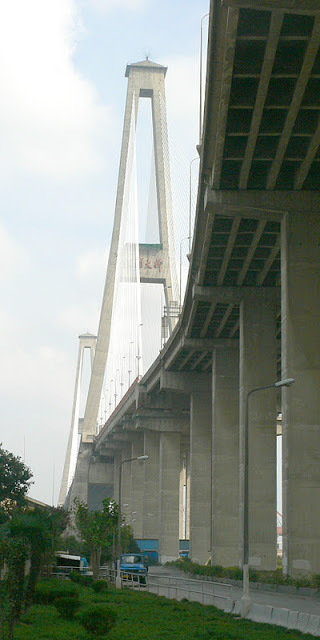 The Xupu Bridge makes an interesting contrast to the Yangpu and Nanpu cable stayed bridges. They had A-shaped and H-shaped towers made of structural steel. The Xupu Bridge has an A-shaped tower but it's made of reinforced concrete. I wonder what percentage of cable-stayed bridges have reinforced concrete towers? I know of a few that are reinforced concrete with a stainless-steel shell, but a grey concrete A-shaped tower looks interesting and possibly unique. The main span is 590 m long, making it a little longer than the Lupu Arch Bridge. It has two towers and two shorter side spans. The superstructure is made of steel girders fastened to a concrete deck to form a composite (steel to concrete) structure. Like the other bridges across the Huangpu River, the Xupu Bridge was designed by the Shanghai Municipal Engineering Design Institute. It was built by the Shanghai Foundation Engineering Company. Shanghai's Bridges: Xupu Bridge by Mark Yashinsky is licensed under a Creative Commons Attribution-NonCommercial-ShareAlike 3.0 United States License. Definitely not unique. Examples of concrete A-frames include Obourg, Belgium; Pretoria Aqueduct, South Africa; Meylan footbridge, France; Knocklyon footbridge, Ireland; Illhof footbridge, France; St Maurice, Switzerland.